Animal Alliance has opposed the use of carriage horses in urban settings – both in Quebec and in BC. Montreal Mayor Denis Coderre says he is considering the options, including the possibility of banning calèche horses, after a horse collided with a car Wednesday. 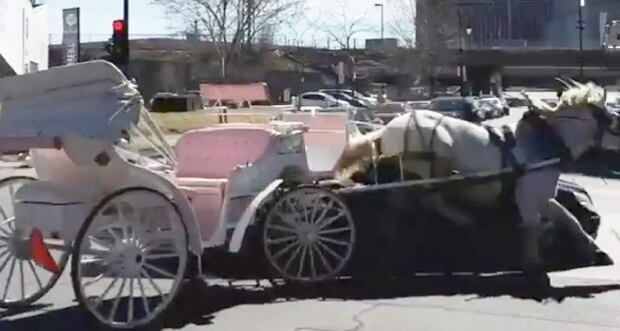 The runaway horse, pulling an empty carriage, rolled onto a car at the corner of Peel and Wellington streets in Montreal’s Griffintown neighbourhood. A driver from the Lucky Luc Stable who would not give his name told CBC the horse, named Mimi, lost a shoe and the driver had gotten out of the calèche to retrieve it. The horse was examined by a city-appointed veterinarian Thursday morning. It wasn’t seriously injured, but it will be stabled until more tests can be completed. The city is conducting an investigation into the incident. Depending on its outcome, it is possible Lucky Luc Stable or the calèche driver could be fined. If the city doesn’t ban calèches outright, Coderre said there are other options which include finding ways to improve the working conditions for the horses. “I think that the horse is a part of our Montreal identity, but it’s all about the condition itself,” said Coderre. Projet Montréal opposition councillor Sterling Downey wants Montreal to hold a public consultation on the future of the calèche industry. He also wants a report on the industry, which was ordered by Coderre last summer, to be made public. Coderre said the report is being analyzed and will be made public soon. Projet Montréal is also demanding stricter rules, including increasing the number of inspectors and suspending all calèche permits for businesses found to be at fault, once an investigation has been completed.